Epistaxis is a medical term used for bleeding from the nose. Anatomically nose is highly vascular region, because of numerous blood vessels, these blood vessel may get bust due to injury, dryness of nasal membranes, crust formation, or due to internal crack, leading to excessive nose bleeding or epistaxis. It is a very common problem and as per a study 70 % of the indian population have experience nose bleeding once in there lifetime. As per Dr.Abhishek, epistaxis must be taken seriously as it may lead to acute emergency in few cases.Epistaxis may produce a very serious and life-threatening condition. Anterior epistaxis: Kiesselbach plexus of blood vessels which is also called as Little's area is situated at anterior nasal septum is responsible for 90% cases of nose bleeding. Posterior epistaxis: Bleeding from posterior nasal cavity is called posterior epistaxis. 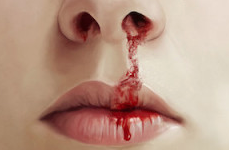 More active bleeding is seen in posterior epistaxis. Vitamin deficiency: Vitamin C or Vitamin K deficiency. Why aura Homeopathy treatment for Epistaxis? Aura homeopathy believe in constitutional medicines concept that cures works on the root cause of epistaxis ansi very effective in controlling its repalse. There are more than 296 homeopathy medicines which can give great relief in epistaxis, based on constitution of the patient.